Nellie, a rescued boxer-pit bull. We have had her 12 years and she has been a true joy to have in our lives. 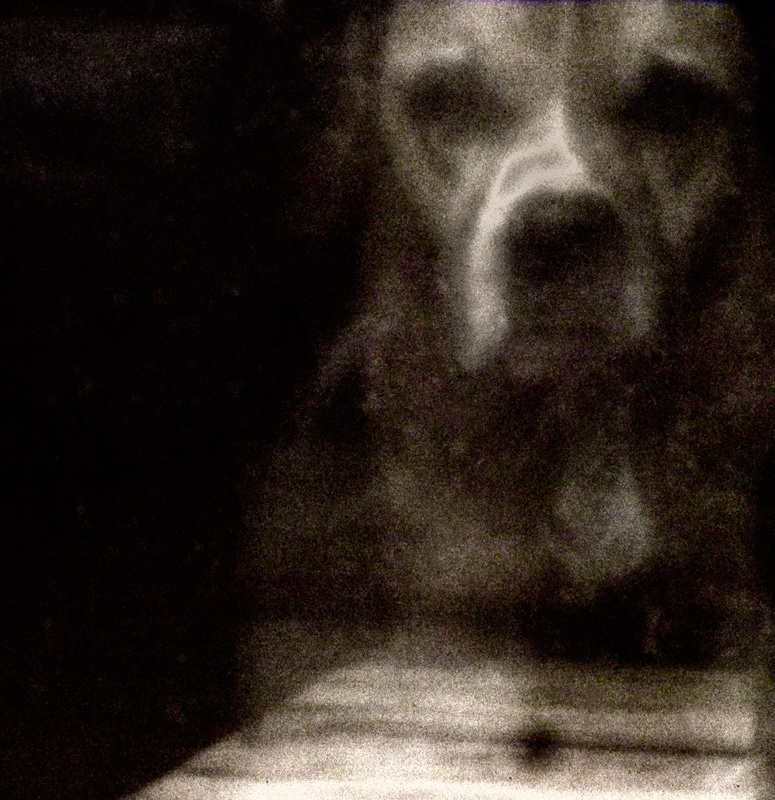 200 micron pinhole through a window. Nellie was kind kind enough to oblige by standing still or a few seconds. This is remarkable, the image as well as the score. Nellie helped create an accidental double exposure, an example of the inherent chaos of long exposures. I'm really happy to see another adventerous soul entering challenges with a pinhole. My fav and top vote = 58th ? Not to worry, a lot of people appreciated this. Oh goodness. This is so marvelous in so many ways. The ghostliness of the dog, the tonal range, the graniness, and the uncertainty of having seen a loved one or merely his ghost. There is something very roz about this image. Oh yes, 4). tanguera thought it was roz. Another lovely compliment. I only knew roz for the amazing macros so this was a good opportunity to look over her profile. amazing. Thanks Johanna for this and all of your thoughtful comments. Message edited by author 2011-01-17 00:58:59.
i would be so happy to claim this... I feel such resonance with this one and with Nancy's in this challenge it is uncanny. Sometimes I think dogs judge us, are we good enough to be their masters. I think they are the true masters. This is my favorite. Primal, abrasive, wonderful tones. In my top ten. Thank you. Ghostly and beautiful image. 8 from me. My one 10! Love this! Wow! That's great. Beautiful noise and shapes. I feel like I'm looking into his soul. Out of Balance, Out of Focus, Deep, Dark, good use of negative space makes my brain go, humm, well huh, So I say WINNER!! Good Luck to you!! WOW - talk about ghostly!!! Proudly hosted by Sargasso Networks. Current Server Time: 04/21/2019 12:08:21 PM EDT.